Oscar waiting patiently for his dinner! So we've gotten the neutral foods down, right? By now I know you've set the base for your pets to have a happy dinner with some great gluten free dog food and some white rice. Now let's talk about cooling foods. 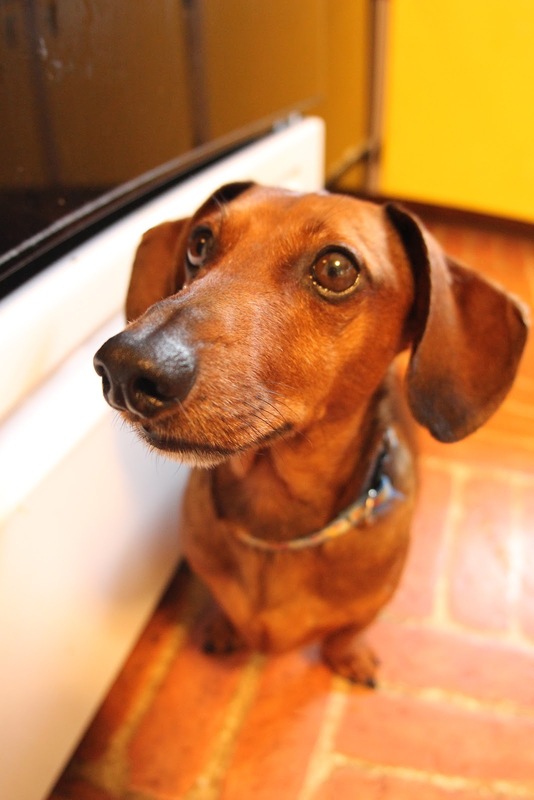 We are getting to the end of summer, and the warm months of the year are a great time to feed your pets cooling foods. But did you know that cooling foods can be good all year long? You can feed some cooling foods, but not too many. We found a good balance because, as you remember from part one, we are also feeding foods that are neutral and sometimes hot (more on hot foods in part three). Traditionally, foods that are green are cooling foods. Cucumbers, green peppers, zucchini, celery, green tea (yes, my dog enjoys a nice glass of green tea every now and again! ), etc. There are also other foods that are cooling that are not green, though. Tomatoes are one. Also mushrooms and watermelon. While it might sound strange to add these foods to a meal for your pet, it really is fascinating how they enjoy them! Watermelon, for instance, was a favorite summer snack for my pets. They would just eat it up like treats! Best of all, they could have as much as they wanted because it is low in calories and also quenches their summer thirsts. I am providing a nice list for you at the bottom of this post, that was provided to me from my vet. Keep in mind that only your vet can tell you the optimal diet for your K9 friends, and this is meant to be a general guideline and in no way a diagnosis. That being said, my dogs are doing great since we started on this. I also found that it sort of changed the way I cooked for myself... for instance, I use up more leftovers with my own pets now than I did in the past leading to overall less waste! YAY. Now to that list! The ones with the star are the ones I have given my dogs.